Items not previously on display at Hever Castle form part of a major collection change guest curated by historian Dr David Starkey in the Castle’s Long Gallery. 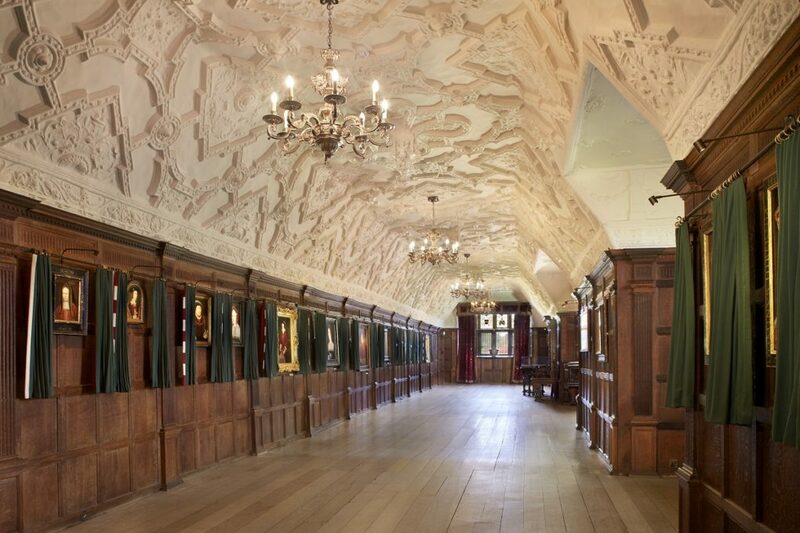 The new permanent exhibition in Hever Castle’s Long Gallery, which has now been opened to the public, depicts the saga from the Wars of the Roses to the Reformation through its art collection. Through 18 original portraits hung in dynastic order the story of the Tudors is told starting from Henry VI and ending with Henry VIII. The Long Gallery, which was created in 1506 by Thomas Boleyn, Anne’s father, has been faithfully restored by a team of experts using innovative lighting, redecoration and the paintings themselves bordered by fabric (depicting whether they were from the York, Lancaster or Tudor families) in order for it to resemble what a typical long gallery would have looked like during the 16th century. Dr Starkey’s attention to detail and demand for historical accuracy has seen the ornate plasterwork adorning the Long Gallery’s ceiling painted a softer off-white to give the effect of lime wash and full-length drapes have been reinstalled at the large stained-glass windows situated at each end of the 98ft (30m) room. Visitors will also have a chance to see items not previously on display. These include a portrait of Elizabeth Woodville, the grandmother of Henry VIII, who was an influential figure in ending the Wars of the Roses and thus the start of the Tudor dynasty. It is on public display for the first time ever. The painting is thought to have been owned by the same family for 400 years, so it has never been seen in public, and is a brand-new addition to the list of known portraits of Elizabeth Woodville. The oil painting of Elizabeth Woodville attributed to the English School depicts her in a widow’s veil. It will be displayed next to her husband Edward IV. Pictures of Henry IV, Henry V, Henry VI and Edward IV which were previously displayed in the Tudor Suite Dining Room and only seen by guests at the 5* bed and breakfast are also part of the Long Gallery exhibition. Dr Starkey adds that the idea for the project was borne out of many visits to the Castle and working with Mould, the star of the BBC’s hit art show, Fake or Fortune? Also on show will be a 17th century Doge’s hat. A doge was the elected Lord of the Italian city-state of Venice. The hat, which will be in a glass cabinet, was one which belonged to former owner William Waldorf Astor and has not been on display in over a decade. It will form part of a display of religious vestments which include a 16th century ceremonial gauntlet and a 15th century bishop’s mitre. David Starkey will also be voicing a new multimedia device which will deliver an essential guide to understanding the impact that the Tudor family made on English history.